Nan-Kirsten Weinstock Forte ’84 was distraught. Her MCAT scores were disappointing, and her dream of becoming a doctor was dying. To console her, an adviser at Swarthmore suggested she try one of her other dreams—science journalism—while studying again for the difficult medical school entrance examinations. “It was fortuitous. I have never looked back. Once I got fascinated with new media, my world changed,” says Forte, now executive vice president of consumer services for WebMD, where she oversees marketing and new initiatives for the online medical-information giant’s Web sites and print magazine. Forte is passionate about how the Internet and other electronic media have and will influence medical information and care. When she went to Long Island University to get a master’s in biomedical communications, it was intended to be a temporary stop on the way to a medical degree. Soon, however, she found herself at Whittle Communications, producing programming for closed circuit TV in doctors’ waiting rooms. The WebMD sites get more than 50 million visitors each month, making it the largest of the approximately 500 Internet-based medical information companies, according to the Health 2.0 Conference, which monitors the industry. Among the sites for which Forte oversees marketing and development are RXlist.com, which deals with drugs and medicine; medicinenet.com, for doctor-produced information; emedicinehealth.com, for everyday medical emergencies; and the all-encompassing consumer site WebMD.com. Forte came to WebMD in 1999, when another Internet-based health information company she was working for merged with WebMD and two other companies to form what would become the industry giant. “We’re not about to sacrifice knowledge for hype,” she says, pointing out that WebMD’s partner site, Medscape, is the largest online provider of medical information to doctors, including such resources as full texts of journal articles. Bennett Lorber ’64, Thomas M. Durant Professor of Medicine in the Infectious Diseases Section of Temple University School of Medicine, says the boom in Internet sources is good for doctors when they are researching, but he is not all that sure it is perfect for the doctor-patient relationship. Forte thinks that the debate over whether Web-based information is a boon or a bane in the doctor-patient relationship is a subject whose time has passed. “That was so many years ago. The question tires me now,” she says. She explains that this kind of problem is not something new: “Yes, for the hypochondriac, more information on the Internet can cause a problem. But, then, in the past, that same hypochondriac would be the one who consulted medical journals and other information—good or bad—that was out there. “I have to believe that sites like WebMD help find the errors more quickly and are generally thought of by doctors, too, as reliable,” she says. Forte says her early career was filled with potholes, though upon reflection, she now sees that she was always in the proverbial right place at the right time. But she did not know that in her 20s. “I worked for a bunch of start-ups that mostly didn’t make it, which was pretty much par for the course in the 1980s,” she said. For about a year, she worked with Dr. C. Everett Koop, the former U.S. surgeon general, under the aegis of Time/Life’s medical division. They did a series of videos on general health topics and also four exercise videos under the title “RXercise,” primarily for individuals with specific afflictions such as heart problems or arthritis. “The videos won a bunch of awards, so when we went belly-up, I still looked good,” she says. There was a front-page Wall Street Journal story about the demise of the Koop project that said she was an “acclaimed patient producer,” which she says induced another nascent company, Health Village, to hire her. This job was her first on the then–barely-used Internet. By the mid-1990s, the Internet boom was on. In lots of other fields, the big brand names were taking shape. One of her bosses at Whittle induced Forte to come to Atlanta to work for a start-up called Medcast, which was producing a “smart” screen saver for doctors—one that would automatically update them daily on medical news and research. Within a year, Medcast merged with WebMD, and Forte became president of programming. Then reality set in. WebMD had to produce content for the Internet, and Forte’s task was to make that happen. She found, strangely enough, that she knew more about the Internet than almost anyone she could find. “Young people just didn’t know it yet,” she says. “There was no one to hire.” Fortunately, in Atlanta she was able to hire journalists and technicians from CNN, also based there. She developed alliances with doctors and research facilities and let the journalists be journalists, albeit for an information Web site. Forte believes she has now cleared that hurdle, but there is plenty left to do. About five years ago, she realized that the company needed to do something retro—publish a print magazine with the WebMD imprimatur. Potential patients were researching medical issues on the Web site but then wanted to take that information into the doctor’s office. Further, Forte wanted to reach her largest captive audience, people waiting to see the doctor. “Suddenly, my competition was Time, Newsweek, and Good Housekeeping, but if I could translate the Internet back into print, we could have yet another market,” says Forte, who now lives in Franklin Lakes, N.J., with her husband Stephen Biale, a stepdaughter who is a sophomore at Lafayette College, and her two younger daughters. 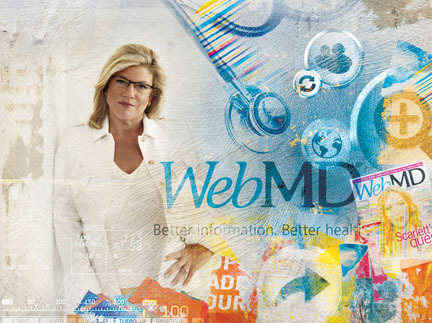 WebMD, the magazine, she says, will soon surpass Prevention as the highest circulation health-related print publication. 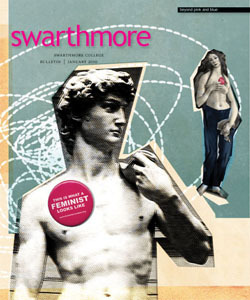 Though she is listed as editor-in-chief of the magazine, Forte has backed away from most hands-on editing or writing. Her current mission is to stretch the WebMD brand in as many directions as possible. Last fall, for instance, she started WebMD Pets, with lots of links both for and from veterinarians. She’s launched a British version of the site, with help from the Boots drug store chain there. An iPhone application launched in 2008 has been downloaded more than a million times. Other applications include the WebMD Symptom Checker, a popular first-aid program, and a drug and treatment look-up with a handy pill identifier. “There will be more applications for PDAs and cell phones this year,” she says. “Many doctors’ offices and medical facilities still have restrictions on those devices, so use is limited now, but the time is not far off when a patient will download what he or she wants from the Web site, have it on a PDA, and show it to a doctor in the office. Robert Strauss is a New Jersey-based journalist who listens to his doctor—most of the time.